Digital cities are moving well beyond their original conceptions as entities representing the way computers and communications are hard wired into the fabric of the city itself or as being embodied in software so the real city might be manipulated in silico for professional purposes. As cities have become more ‘computable’, capable of manipulation through their digital content, large areas of social life are migrating to the web, becoming online so-to speak. Here we focus on the virtual city in software, presenting our speculations about how such cities are moving beyond the desktop to the point where they are rapidly becoming the desktop itself. But a desktop with a difference, a desktop that is part of the web, characterized by a new generation of interactivity between users located at any time in any place. 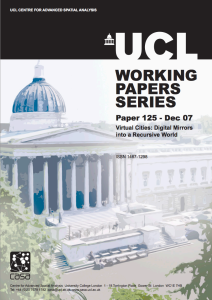 We first outline the state of the art in virtual city building drawing on the concept of mirror worlds and then comment on the emergence of Web 2.0 and the interactivity that it presumes. We characterize these developments in terms of virtual cities through the virtual world of Second Life, showing how such worlds are moving to the point where serious scientific content and dialogue is characterizing their use often through the metaphor of the city itself. Download the full paper as a .pdf (1.8Mb).